The Beatles concert in Dublin has spawned a documentary and a book but until today there was no official commemoration of the night that many people believe was a seminal moment in Irish social history. Journalist Paddy Murray was the person who proposed the idea and it was accepted by Dublin City Council's Commemoration Naming Committee. 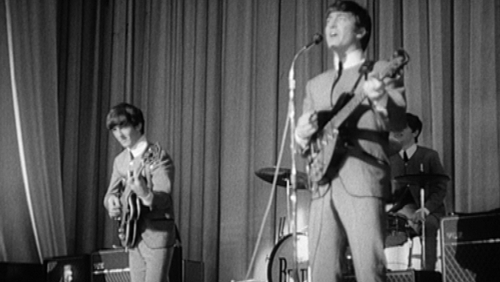 The plaque was unveiled by Lord Mayor Nial Ring and broadcaster Gay Byrne, who was at the concert, who revealed that while he was working in England The Beatles asked him to become their manager. The event was also attended by Terrie Colman Black who was at the concert as a schoolgirl and who went on to amass a collection of Beatles memorabilia that she has donated to the Rock and Roll Museum. She believes it changed the social scene in Ireland by giving teenagers a sense of freedom and glamour. The concert happened at a time when Ireland's population had begun to experience sustained growth for the first time since the Famine - the country's population had dropped to its lower-ever point just two years beforehand. But the scenes of Beatlemania came as a shock to official Ireland with newspapers quoting gardaí saying they had never seen anything like it. But today retired former Garda Chief Superintendent Tom Butler who was on duty in Middle Abbey Street that night said from what he has experienced since it was not that bad. He said many of the gardaí were teenagers like himself and just as excited as the fans. The Beatles themselves had to be taken away in the back of an Evening Herald newspaper van to the Gresham Hotel where they were staying. According to Pete Brennan, President of the Beatles Fan Club Ireland, there are a number of sources that credit the experience in Dublin with the idea for a film about their touring which became Hard Day's Night.